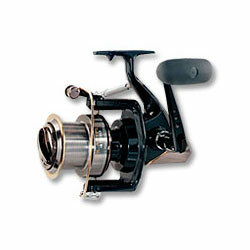 Saltwater reels with a high bearing count, for exceptionally smooth cranking. Skirtless Long Stroke aluminum spool with titanium nitride lip; 11-bearing system including Infinite Anti-Reverse roller bearing; Gyro Spin balancing for wobble-free retrieves; Twist Buster line twist reduction system; one-touch folding handle; FREE aluminum spare spool. "I bought a pair of these for me and my son. We have been surf fishing in So. Cal. We have been doing it old school, with 12' rods and 20 lb test. We have taken them out 3 times so far and they have performed awesome. They cast like a dream." "For it's affordable price, it casts just as good as it's bigger brother, the Emblem. Mated to a 10ft Penn Power Stick with 30lbs braid, it goes! Daiwa did good with the titanium lip. How come the Emblem doesn't have that? Hmmm. Conclusion: Great investment for it's price and rockets your lure and bait way out there! "